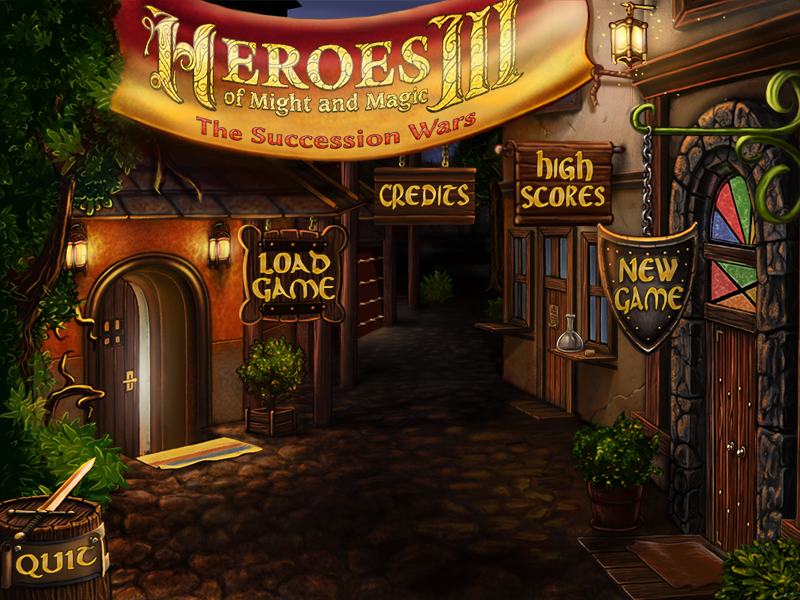 Heroes of Might and Magic III: The Succession Wars is always ready to welcome new recruits! The main directions of work which are prioritized are listed below. - Various game assets: adventure map objects, creature design, creature animations, interface assets, battlefield obstacles, battlefield terrains, townscreen assets, hero portraits, various icons and buttons, etc. 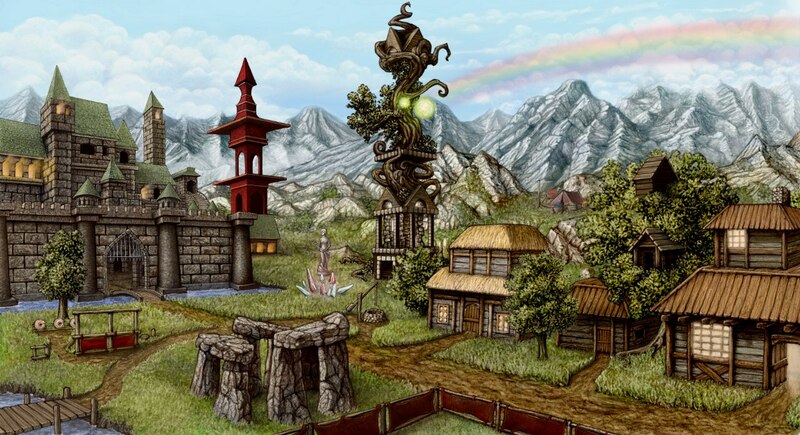 - Single Player Menu backgrounds, Obelisk Puzzles. - New web design for our ModDB Page customized at least like this one. The graphics is on us: preferably, we will use Ashirox's Tavern and make the buttons on signs: Forums, Twitter, etc. - H1-to-H3SW, H2-to-H3SW and H3-to-H3SW map conversions. 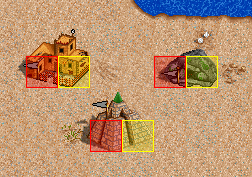 The latter represent classic Heroes 3 maps loaded in H3SW map editor with properly fixed object passabilities. See H3SW Map List. - Playtesting of the converted maps, analyzing the map gameplay, its difference from classic one (just as a note for us), searching for broken objects. Well, I'm volunteering here for making some 256 pixel art, but the thing is I'm not sure which software do I have to use. Last year I've elaborated some samples for a game in development using Gimp. Is it fine for you? For you, I can offer to make a few adventure map dwellings for the start. This is a new feature of H3SW and it is highly demanded since we have to fill the whole list with our own. Unfortunately I'm in the countryside for a few days so I cannot provide a decent guideline right now. There are some technical restrictions in the game that require attention. Perhaps Uhm can spare the details while I'm away. I suggest the Orc's hut or Minotaur's maze. As for the big artworks, they are meant to be digital, and yes, I don't believe anyone can handle it. Ashirox's made a too high standard for digital arts, so I think I will try to get a commission art from him or a few other pro artists I know. Anyways, Heroes 1-2 and MM6 fan art are more than welcome in the respective topic. Please note that it's not a problem if the dwelling is not perfect. We can improve it ourselves. The flag for it is not needed because adding a flag is a special procedure and we will handle it ourselves too. Thanks! I'll do my best. On the other hand, there's no hurry: I'll wait for you to go back home and we'll talk about those details, ok? In regard to the traditional artwork that I put on the table, I think it would be interesting in order to perform our incoming ideas and projects. I mean, like in the movies: first you make drafts of the scenes as a previous step for filming them. Yep, I'm gonna make some fan art, and who knows? perhaps in the future I'll lead my work into digital waters. I will be gone for a few weeks, but I can still put some clues on making map objects - all new buildings are welcomed, however we're in need of new creatures' dwellings. - Creature dwellings should have only one red square and one yellow (one by one) and as many passable (transparent) squares as you want. - Don't worry about shadow and flag, we've got proper utilities so we will make it later. 8. Golem factory - we will use object from H2, but now it is placeholding war machine factory. We can draw new dwelling or machine factory. IV.Necromancer - For now he doesn't need new buildings, some could be polished a bit, but later. Other important buildings are: school of magic, university, sanctuary, seers' huts and cover of darkness. Of course You can do anything you want, interface is mostly done, but you can also animate creatures or help with townscreens, we can send you some drafts. Orzie mentioned that there are some lacking portraits. All other squares must be left "fully passable" even if there are pixels standing out. The shadow is not needed. 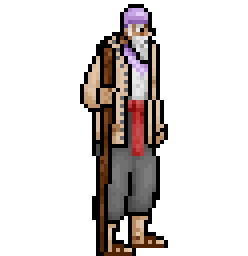 Also I must note that Dervish's dwellings are not needed right now, because we are currently developing the general concept of this faction, including the visual concept. I also made a Russian guideline for graphics in the past on DF2 forum and I plan to translate it later. It is likely that the new dwelling design should replicate the concept of the dwelling on the townscreen, but the perspective is likely to be different. This will provide variety to the project. Also, don't use colors 0-9 and 247-255 in the given palette. These are maintenance colors and they are used for technical purposes. This project is very interesting. I would like to try my hand at some of the pixel art. I am also interested in the 2D art designs, and I am willing to give those a try, but I would like to clarify something. I'm assuming you intend to use the newly drawn screens as a replacement for the old ones, correct? If that's the case, each building is going to have to be done separately, or at least digitally, so that they can be separated into layers. Which I'm fine with, I just need to make this clear before I start anything. And, of course, it looks like you want it done in a story book style. Concerning the 2D art, we are pessimistic. There are only 2 artists known who are able to make it qualified enough: Ashirox and Dominic-B. The latter is not available for contact, unfortunately. Once we got some guarantees from a former NWC employee, Brian Kemper, who is the creator of original Heroes 3 puzzle artworks, but later he disappeared. So that I guess 2D art is a matter of professional artists if we will be able to find any more. We cannot have artworks which differ too much in style and quality, they all must fit to each other. Concerning the townscreens, in fact we just use the same H2 graphics when compiling new townscreens for the classic castles. To fill the space and H3 functionality scheme, we create previously unseen parts of those buildings and some new ones. It's a hard work so I would suggest to try simpler pixel art like icons or map objects at first to gain some experience and better understanding of the actual scale of the work. Also, simple pixel art still helps us a lot even if it is not very much qualified, because it is better for us to improve rather than make from scratch. Alright, I understand. Thank you for the clarification. I will see what kind of pixel works I can come up with in my spare time. Do you need completely new maps as well? In the past I made Pyramide from H2 for H3, but I'd prefer to make my own new maps instead of copying consisting ones. Not now. Currently we plan to feature only classic H1-H2-H3 maps for the next releases until v1.0. v1.0 release may feature some new maps with the full object diversity. Some kind of map contest for the official release may be created in future. 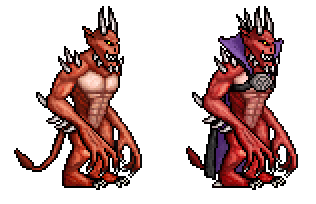 I would like to contribute a bit with Sprites. Welcome to the Forums of Enroth, Thorjac! Feel yourself at home. Your adjustments over the Dervish 2nd level draft are very welcome, they should serve as a nice basis for future improvements. I will update the Dervish faction design document. If you are ready for some more work, feel free to check Uhm's post of Fri 24 Jul - 18:28 in this topic. There is a huge amount of work for the map objects: creature dwellings and some others. means, I'll explain: the RED square in the WoG Map Editor is impassable, while the YELLOW square is "active", e.g. a dwelling entrance. You don't have to draw any squares, you should just keep in mind that your creature dwelling should satisfy the passability rule on the adventure map, with each square being of a standard 32x32 pixels size. If you have any other questions, feel free to ask them in the Graphics Discussion topic. What program do you all use for pixel art ? It differs. I prefer Photoshop for H3SW, sometimes I use MtPaint for making some H2 graphics when I require more strict palette index control. In general it doesn't matter, the only necessary thing is keeping H2 palette. Thanks. I may try the programs you mentioned for Quake 2, for making textures at pixel level. Hiya! Would you be interested in a concept like that? Like a third-level creatures for an advanced version of the mod? I'm able to make it better, but before to do more stuff, I wanna know your opinion. 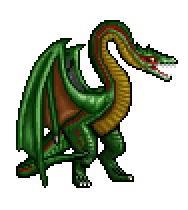 I have in mind some more creatures: the precious faery dragon from HOMM III, so the evil beholder, a reworking of the current HOMM II's elves, which I consider a bit... naïf, a dark knight... And why not? Adding some dwarves to the table, y'know, as a resemblance from the fifth instalment. Dwarfish, but very nice attempt especially the bear. I bet this one is from the Kronverk faction from Hota. I bet this one is from the Kronverk faction from Hota. Actually it's all mine, I didn't even know there was an attempt to do so from HoTA team. Thanks for the input! Hehh, my bad! It just slipped out of my mouth. The bear looks like a lot of fun. We actually even made some drafts for Goblins mounted on Boars and Wolves. This can also be saved for some future ideas. Yet, there's not much room for that creatures in the game, and we anyway have other problems for our upcoming v0.8 beta release. We actually have our own Death Knight presented on the second promo screenshot. I would ask you to write in another thread with fun developments, it's reserved for team recruiting. Subject: Re: H3SW Recruitment Point - Enroth Needs You!